U.S. service members walk off a helicopter on the runway at Camp Bost in Helmand Province, Afghanistan on September 11, 2017. That public information blackout, along with the recent suspension of Pentagon reports on airstrikes and collateral damage in Afghanistan, has some lawmakers on Capitol Hill raising red flags. "What's your view on the detail of the information that should be released?," Rhode Island Sen. Jack Reed asked Lt. Gen. Scott Miller at his June 19 confirmation hearing to be the next U.S. commander in Afghanistan. Miller assured Reed, the Senate Armed Services Committee's top Democrat, that if confirmed, he would be "very transparent" about what's going on in Afghanistan during appearances before Reed's oversight panel. "As for details that are being on hold," Miller continued, "I would need to go forward and understand why we're holding back that information." Miller's apparent uncertainty about that policy is understandable: the genesis of the clampdown on information about the nation's longest-fought war has indeed been one of conflicting messages. First, there was Defense Secretary Jim Mattis' assurance last August that the Pentagon would be more transparent about reporting troop levels in Afghanistan. "Frankly, I had to change the accounting process because we couldn't figure out how many troops we had there," Mattis told reporters at the Pentagon. "So believe me, I understand the problem. But once we know how many there are, hopefully we've told you what — about what there is." One week later, President Trump sent a conflicting policy signal on how well the public would be informed about how many U.S. forces were deployed in Afghanistan. 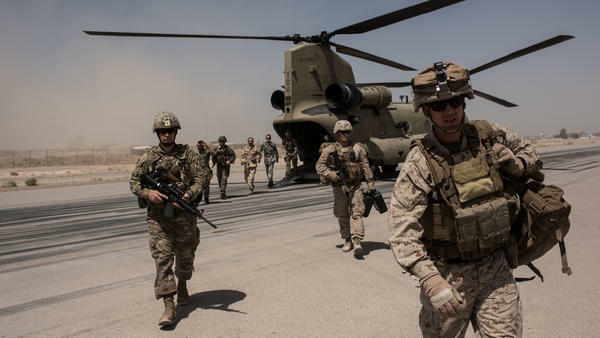 "We will not talk about numbers of troops or our plans for further military activities," Trump declared while announcing plans for stepping up U.S. military operations in Afghanistan. "America's enemies must never know our plans, or believe they can wait us out." The next week, Trump's directive did not seem to have made its mark yet at the Pentagon. "When I say transparent," Joint Chiefs of Staff Director Lt. Gen. Kenneth McKenzie explained to reporters asking about how troops in Afghanistan would be tallied, "I'm talking about accounting for force levels that include those forces that are temporarily deployed. They will now be reported." Indeed, in the Sept. 30, 2017 quarterly update from DMDC, part of the Defense Department that publishes online data on military personnel, on U.S. troop deployments worldwide, 13,329 uniformed American forces are reported in Afghanistan — up from 10,107 in the previous report. But in the next DMDC numbers update for Dec. 31, 2017 (posted on March 30, 2018), the Pentagon falls in step with Trump's vow not to give out troop numbers. Only blank spaces appear for Afghanistan in that DMDC report — ditto for Iraq and Syria. An explanation is offered in a note at the bottom of the spreadsheet. "With ongoing operations," it reads, "any questions concerning DOD personnel strength numbers are deferred to OSD Public Affairs/Joint Chiefs of Staff." Translation: if you want to know how many U.S. forces are deployed in these three nations at war, you'll have to ask the public affairs officers detailed to Mattis' Pentagon office suite. That's where, after two weeks of unanswered emails and phone messages, I finally had a chance to sit down with a Pentagon spokesperson to hear why those numbers were no longer being posted online. "We have to make sure that the American people know what their forces are doing," Army Major Adrian Galloway said. "But we have to protect our forces as well. And a part of that is making sure that we keep a handle on what information we release to the public in general." In May, five House Democrats wrote Secretary Mattis demanding he rescind the new policy of redacting U.S. troop levels for nations "with ongoing operations." "In the past there's at least been transparency. Now there isn't," says Vermont's Peter Welch, who co-signed the letter to Mattis. "And whether the number's going up or down, whether there's success or failure, it's completely unknown." In his response to the congressional missive, Mattis portrays the DMDC's steering of the inquiring public to his public affairs office for information about war zone troop levels as a change that's an actual improvement. "It increases the Department's transparency and consistency," Mattis writes, "by publicly reporting certain previously undisclosed termporary duty personnel deployed in Afghanistan, Syria and Iraq." If those numbers are being publicly reported, even some members of Congress who sit on the armed services panels have yet to hear about it. "Well, I'll get back with you," South Carolina Republican Sen. Lindsey Graham tells me when I ask him about the absence of publicly posted troop numbers. "I didn't know that." Pentagon Spokesman Galloway did give me a number for U.S. troops currently in Afghanistan - 14,000. But he acknowledged it's not exact. "I can tell you that that number is approximate, it's very close to the real number," he told me. "I do know the real numbers, but unfortunately the real number is classified and I just can't talk about it." Even though the DMDC in the past posted troop numbers for Afghanistan and other war zones only once every quarter and usually months late, Galloway argued that doing so could "telegraph to our adversaries what it is we're doing at a particular time." Critics are not persuaded. "I've yet to hear anybody articulate one instance where those numbers led to an operational risk," says Jason Dempsey, an analyst with the Center for a New American Security. After two tours in Afghanistan and another in Iraq, Dempsey retired as a lieutenant colonel in the U.S. Marines and has written extensively on civilian-military relations. "When we decide we're gonna be just like every other insecure, two-bit, tinpot dictator country, in that we've got to keep everything under wraps and we can't telegraph our moves," he says, "what we're essentially saying is, we don't want an engaged public." Knowing the numbers of American troops sent to war zones can make a difference in the public's awareness of ongoing conflicts, says another critic of the Pentagon's new policy of providing those numbers on an ask-only basis. "Numbers are a kind of bad shorthand for talking about American commitments, but they're a useful starting point for a conversation," says Loren DeJonge Schulman, who advised former Defense Secretary Robert Gates and served on the National Security Council during the Obama administration. "And if we don't start those conversations, Americans will have no way of knowing we have thousands of troops at risk overseas. We don't talk about that — the president never talks about it." The danger with the new numbers policy, DeJonge Schulman adds, is that should the Trump administration decide to substantially increase U.S. forces in Afghanistan or other war zones, the actual numbers would remain classified. In the past, if you wanted to know how many U.S. troops there were in war zones like Iraq or Afghanistan, you could find that information at a public Pentagon website that was updated every three months. But then, late last year, the Pentagon stopped posting those numbers for Iraq, Syria and Afghanistan. Now that is prompting questions on Capitol Hill. NPR's David Welna has the story. DAVID WELNA, BYLINE: Before the Senate approved him last week to be the next commander of U.S. and NATO forces in Afghanistan, Lieutenant General Scott Miller got a tough question at his confirmation hearing. Rhode Island Democrat Jack Reed wanted to know why the flow of information about U.S. operations in Afghanistan has recently taken a nosedive. JACK REED: What's your view on the detail of information that should be released? WELNA: Miller assured the Armed Services Committee's top Democrat that if confirmed, he'd be transparent with that panel. AUSTIN MILLER: As for details that are being - on hold, I need to - we'd need to go forward and understand why we're holding back that information. WELNA: The Trump administration has been sending conflicting messages. Last August, Defense Secretary Jim Mattis assured reporters the Pentagon would be more transparent than it had been about reporting troop levels in Afghanistan. JIM MATTIS: Frankly, I had to change the accounting process because we couldn't figure out how many troops we had there. So believe me; I understand the problem. But once we know how many there are, hopefully, we've told you what - about what there is. WELNA: The next week, President Trump essentially said the opposite. PRESIDENT DONALD TRUMP: We will not talk about numbers of troops or our plans for further military activities. WELNA: Trump added that America's enemies should never know its plans. But a week later, the director of the Joint Chiefs of Staff, Lieutenant General Kenneth McKenzie, reiterated Mattis' promise of greater transparency. KENNETH MCKENZIE: When I say transparent, I'm talking about accounting for force levels that include those forces that are temporarily deployed. They will now be reported. WELNA: And the next quarterly report of the Defense Manpower Data Center did have those numbers. But the force levels not just for Afghanistan, but for Iraq and Syria, as well, have been left out of all the updates since then. Readers are asked to direct any questions about those countries to the Office of the Secretary of Defense. That's where, after two weeks of unanswered queries, I finally got this explanation for the omission of war zone troop levels from Pentagon spokesman Major Adrian Galloway. ADRIAN RANKINE-GALLOWAY: We have to make sure that the American people know what their forces are doing, but we have to protect our forces, as well. And a part of that is making sure that we keep a handle on what information we release to the public in general. WELNA: Five House Democrats wrote Secretary Mattis, demanding he rescind the new policy of excluding U.S. troop numbers in war zones from the Pentagon's quarterly reports. One of those Democrats is Vermont's Peter Welch. PETER WELCH: In the past, there's at least been transparency. Now there isn't. And whether the number's going up or down, whether there's success or failure, it's completely unknown. WELNA: Unknown even to members of Congress. Here's what South Carolina Republican Senator Lindsey Graham had to say about the Pentagon's suppression of troop numbers. LINDSEY GRAHAM: Well, I'll give that with you. I didn't know that. WELNA: Pentagon spokesman Galloway did give me a number for U.S. troops currently in Afghanistan - 14,000. But he added this caveat. RANKINE-GALLOWAY: I can tell you that that number is approximate. It is very close to the real number. I do know the real numbers, but unfortunately, that - the real number is classified, and I just can't talk about it. JASON DEMPSEY: I've yet to hear anybody articulate one instance where those numbers led to an operational risk. WELNA: That's retired Army Lieutenant Colonel Jason Dempsey, who did two tours in Afghanistan and another in Iraq. He is now at the Center for a New American Security and has written extensively on civilian-military relations. DEMPSEY: When we decide we're going to be just like every other insecure, two-bit, tin-pot dictator country, and that we've got to keep everything under wraps and we can't telegraph our moves, what we're essentially saying is, we don't want an engaged public. WELNA: Former Pentagon adviser Loren DeJonge Schulman says numbers are key to people's awareness of ongoing conflicts. LOREN DEJONGE SCHULMAN: Numbers are kind of a bad shorthand for talking about American commitments, but they're a useful starting point for a conversation. And if we don't start those conversations, Americans will have no way of knowing we have thousands of troops at risk overseas. We don't talk about that. The president never talks about it. WELNA: All while those numbers under Trump have actually gone up. (SOUNDBITE OF YUUTSU'S "LONGING") Transcript provided by NPR, Copyright NPR.